I'll admit, I'm a little obsessed with the various ways you can incorporate a white shirt into an outfit. With such an array of options available when you start with this staple item, it's no wonder I go a little cray cray! 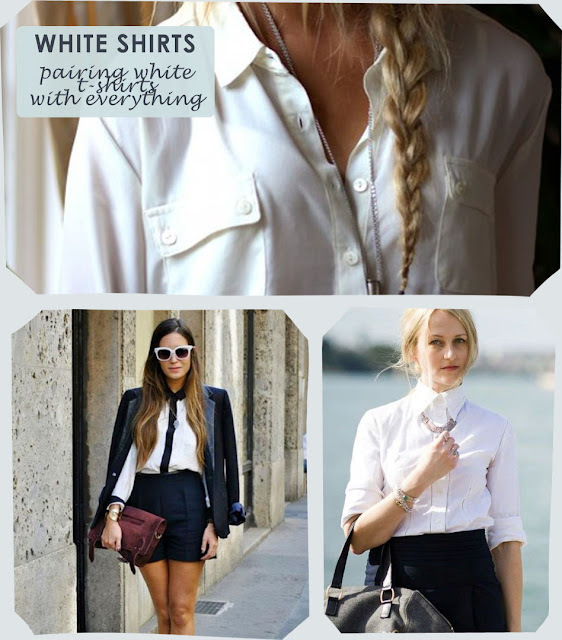 White shirts are great, they go with so many things! I love how Blake Lively wore it :) Can't wait to see how you wear it in your outfit. I love white blouses too! I wear them so often and agree that they do go with everything. OoooOooh Which camera are you getting!? :D Can't wait to see the new photos. I'm loving all the shirts around with the contrast plackets & cuffs. Love these looks - pairing white tees with everything is such a good idea! Lovely blog I hope mines as good as this someday, I'm now following you. Please check mine out as I'm just getting started and would appreciate some followers and some comments. Amazing blog! !I invite you to visit my blog and if you like it to follow me from google friends and i will be happy to follow you!! I love white shirts paired with anything because it's so chic & effortless! Great post and I absolutely love your blog, so definitely following! Hey lady. I luv a white shirt or tee too. I hope you share with us what type of camera you get since i'm in the market for one too. Thanks for checking out my blog. Your comment was very thoughtful. Im definitely following you. I love your inspiration photos, so many ideas to wear a white shirt. this blouse is so beautiful and timeless! I started following you, I hope you will follow me back. Love this style so much! Great inspiration! Loving your blog as well and following you now on Bloglovin and GFC :) hope you were able to follow too! White is so perfect! There's seriously nothing better than a crisp white t-shirt. I'm on the market for a white blouse. Thinking I'm going to get an Equipment one. Perfect outfits! Each of them was so much adorable!